Morocco is a wonderfully diverse country packed full of incredible landscapes and colours, all of which shines through in the art of the country. Even people who aren’t the types to weight themselves down with trinkets should be prepared for the beauty of a Tafraouti slipper and how enticing it is to buy them. Moroccan handicrafts remain as richly diverse and unique as the country of Morocco itself, and that ideal memento of Fez may be much different than the trinkets you picked up in Essaouira. What’s more is that the trinkets you find are likely to be in the spirit of the area you find them in. Morocco is not a country where one finds mass-produced goods after all. About everything that you find in the country was made just a few yards away by traditional artisans working out of small workshops and community cooperatives. 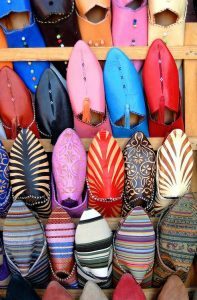 Moroccan footwear, typically referred to as babouches, are handmade using locally produced leather. Even though these slippers can be found across the country, the best place to find unique, incredibly crafted ones is Fes. The famous tanneries of Fes provide the raw materials, and you can watch master artisans at work as they sew their latest masterpieces for the shops lining the medina. If you head further south, then you’ll end up in Tafraout, also known for their footwear. Slippers from Tafraout tend to be much more colourful than Fes slippers, often made with bright patterns. Marrakech and Fes are the best places to get the perfect carpet. With the help of a guide, you can choose between different patterns, colours, and sizes. Guides can also give you more information on the origins of the symbols and motifs used in the design of the rugs. Don’t rush through smaller cooperatives as many small towns have carpet and weaving co-ops that are proud to show off their wares. If you’ve got something in mind, then a more modest outpost will usually be happy to create a custom order rug just for you. 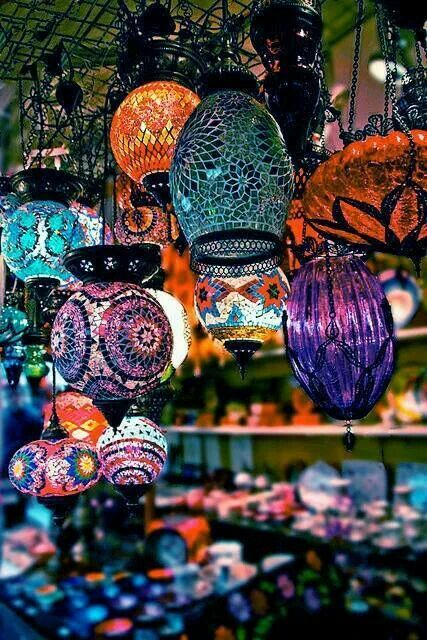 Moroccan lanterns are incredible pieces of craftsmanship and they look incredible in the dark. Marrakech has some of the best lantern makers in the country, but lanterns can be found just about anywhere in the country. Shop assistants will be able to help you track down different shapes, sizes, and colours of lamps, so be honest and open about what you want to find and buy. Even if someone doesn’t have what you want, they will likely know someone that does and point you in their direction. Wood carving is the bread and butter of Essaouira. 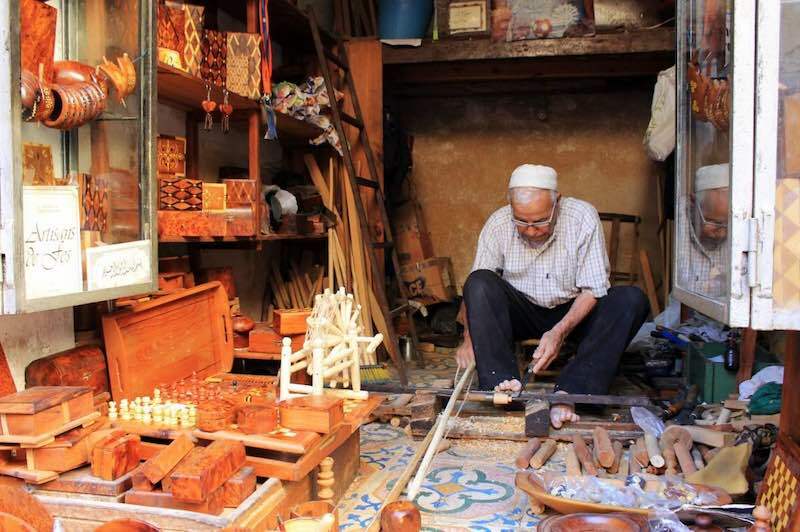 Woodcarvers can be found across Morocco, but there’s something special about the thuja wood that can only be found in the southern coast of the country. Locals have been using it to create masterpieces for several centuries. Whether it’s something small like a children’s toy or a small box, or something larger like a plate or chess board, sculptors have mastered turning the mundane into something truly beautiful. Very few visitors walk out of the city without some trinket to remind them of the brilliance and relaxing atmosphere of the Moroccan coast. 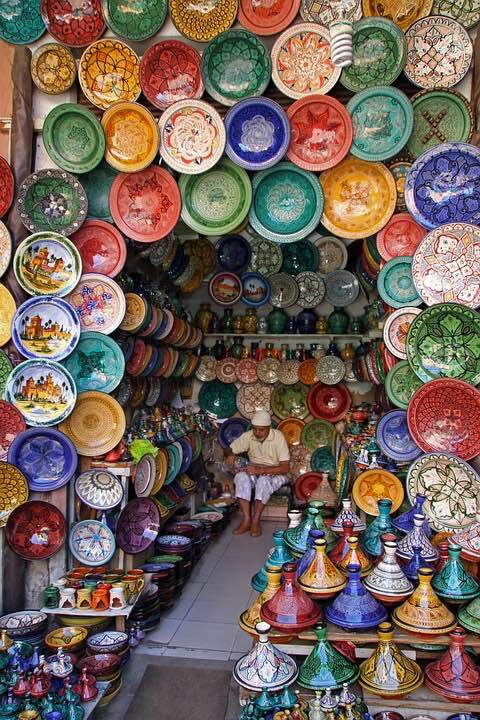 Moroccan pottery is different in every part of the country, but some cities have gone above and beyond when it comes to ceramics. 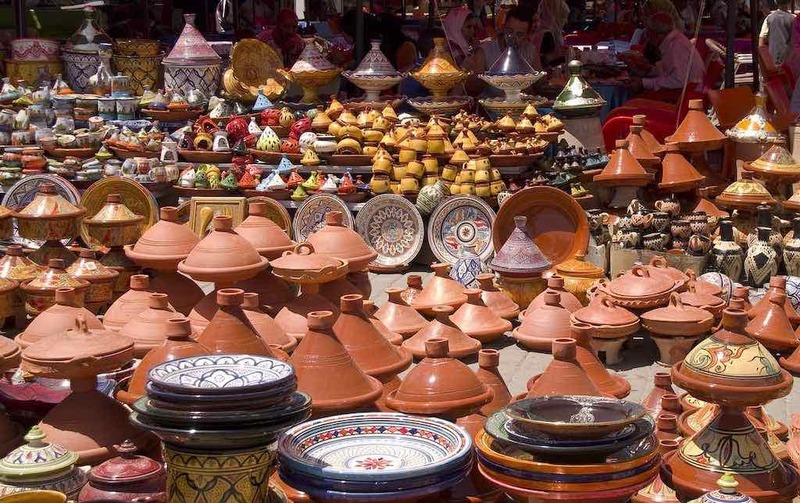 Safi is one of the best cities to find ceramics, as several markets are dedicated to pottery. Safi also has a wide range of styles and shops, along with a relaxed shopping atmosphere. Given that the pottery is generally made onsite, you’re generally dealing with the person that crafted the plate that you’re holding. Tamegroute is known for their unique green-glaze pottery, so stop by there as well. 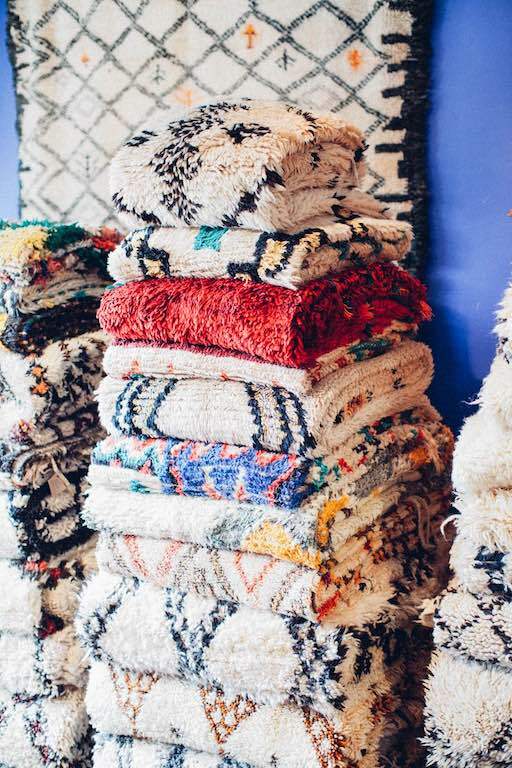 As great as all this sounds, we would be remiss to not mention the natural dyes and oils, knitwear, tapestry, leather, cooking supplies, and other handcrafted goods to be found across the Moroccan souks. 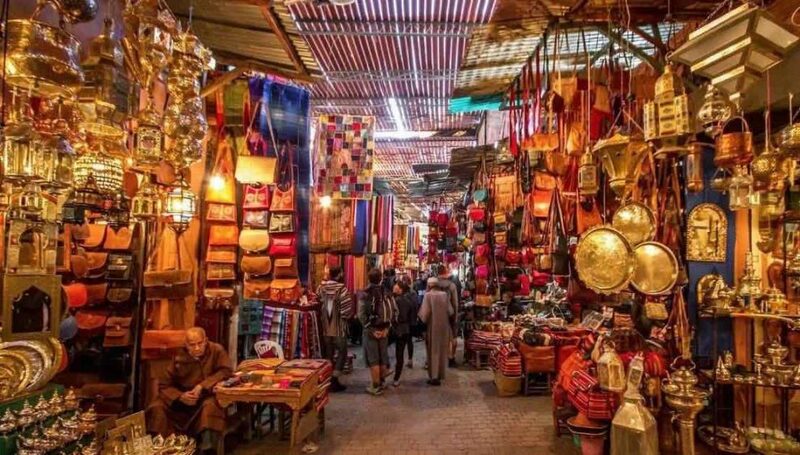 As is the case with just about everything else in Morocco, you need to approach the markets with an open mind and some curiosity. Be prepared to spend your time looking around, and be open to grabbing anything that stands out to you. I am in love with the handicrafts color and design. They have earth tones and they really are the perfect decorations for rustic, boho or laid-back interior look at home.